Torino found an unlikely hero as captain Kamil Glik scored two second half goals to end a run of six Serie A games without a win. Giampiero Ventura once again left Bruno Peres on the bench, whilst Alexander Farnerud returned to the midfield and Amauri was surprisingly preferred to Fabio Quagliarella upfront. The away side who were unbeaten on their travels all season were creating a number of chances, with Andrea Bertolacci drilling a shot wide of Gillet's goal. At the other end, Alexander Farnerud rattled the crossbar with a free kick from fully 30 yards. Toro were beginning to create chances with ease, as Venezuela international twice went close, firstly with a volley, and then moments later with a header which went over the bar. The home side were made to pay for giving the ball away in their own half three minutes before half time, as they were punished by former Juventus winger Iago Falque whose low shot from just outside the area found the bottom corner. The Granata were level just seven minutes into the second half as Farnerud's deep free kick found Kamil Glik who poked home at the far post. And the comeback was complete ten minutes later as although Emiliano Moretti was initially denied by Eugenio Lamanna's fine save - Glik was on hand to head home from a yard out. Torino held on for only their fourth Serie A win of the season, and they go into the winter break in 14th position knowing that much improvement is still needed to replicate last season's top half finish. Torino's winless run in Serie A stretched to six games as they were unable to find a breakthrough against newly promoted Empoli on Monday evening. Giampiero Ventura surprised many by dropping captain Kamil Glik, with Pontus Jansson taking his position in central defence, whilst Cristian Molinaro and Cesare Bovo also started. It was the home side who came closest to scoring in the early stages, but Matias Vecino's long range shot went wide of the target. Simone Verdi, who is on loan at Empoli from Torino, forced Jean Francois Gillet into making a save from a free kick. On the stroke of half time, in form Josef Martinez had the Granata's best chance of the half, but he was denied by home goalkeeper Luigi Sepe. Verdi was continuing to impress against his parent club, and Gillet had to be at his best to deny the former AC Milan winger. In the early stages of the first half, Fabio Quagliarella had a great opportunity for Toro but was unable to make good contact with an overhead kick. In the final ten minutes, Cesare Bovo had a great opportunity to win it for Toro, but he blazed over the bar. Pontus Jansson received a red card in the dying seconds for a second yellow card, as Toro's poor domestic form continued. 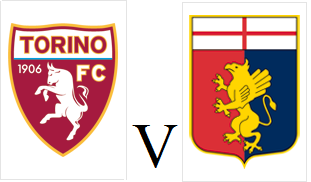 With just one game remaining until the winter break, Torino next fixture at home to Genoa is becoming increasingly more important. 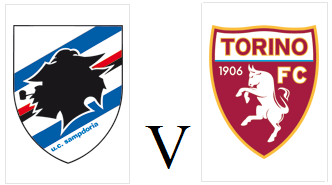 Torino will travel to newly-promoted Empoli on Monday evening looking to end a run of five matches without a win. 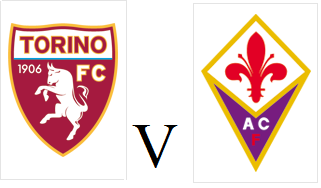 After scoring twice in the Europa League in midweek, Josef Martinez should partner Fabio Quagliarella upfront, whilst Alexander Farnerud and Antonio Nocerino return to the squad. Empoli have surprised many since being promoted in the summer, and are currently four places and two points above the Granata in the Serie A table. 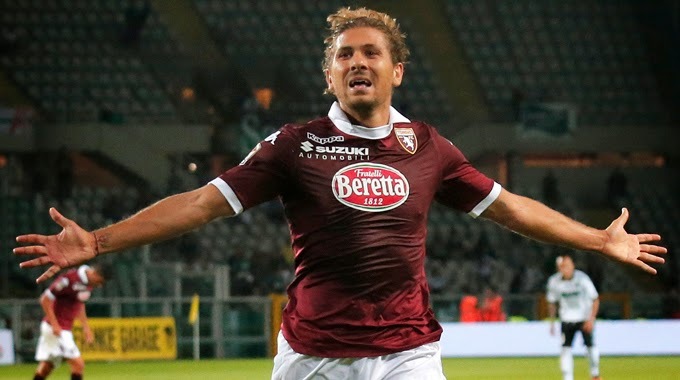 Torino loanee Simone Verdi scored his first goal of the season in the impressive draw against Napoli last weekend. Torino qualified for the last 32 of the Europa league after a sensational 5-1 in Denmark over 9 men København on Thursday evening. 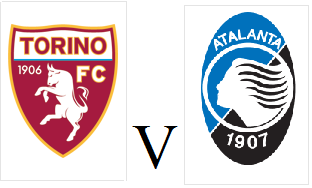 The Granata only needed a point to ensure qualification so Giampiero Ventura chose a strong line up, with Josef Martinez partnering Amauri up front, and Cesare Bovo in an unfamiliar midfield role. Toro had a terrible start and were behind only five minutes in comical fashion as Gaston Silva's poor back pass lead to Kamil Glik's clearance ricocheting off Daniel Amartey and flying over Daniele Padelli and into the net. However, Toro were level less than ten minutes later as Nikola Maksimovic's ball found Josef Martinez in space, and the Venezuelan international fired a powerful volley past Stephan Andersen in the home goal. The game turned on the half hour mark, as Martinez, who was causing the København defence a number of problems, was fouled by last man Mikael Antonsson who received a red card and the Danish side were down to ten men. Five minutes before half time, København were reduced to nine men when Amauri was bundled over in the area by Matthias Jørgensen. Amauri stepped up and scored the penalty to give Toro a lead going into half time. 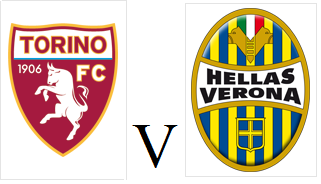 The game was over as a contest within eight minutes of the second half, as Torino scored three quick fire goals. Firstly Omar El Kaddouri's through ball found Josef Martinez who neatly clipped the ball over the goalkeeper. 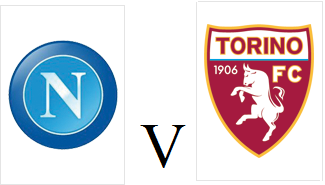 Toro then scored a fourth goal when Matteo Darmian volleyed home Gaston Silva's cross from just inside the area. Gaston Silva scored his first Torino goal moments later, as he also volleyed home from El Kaddouri's inadvertent flick on. 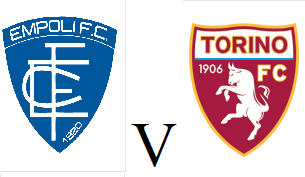 Torino gave youngster Giovanni Graziano a debut for the last 25 minutes, as Toro cruised to a victory that put them through to the last 32. Club Brugge scored a last gasp winning goal against HJK Helsinki to top the group, so the Granata will be unseeded for Monday's draw. 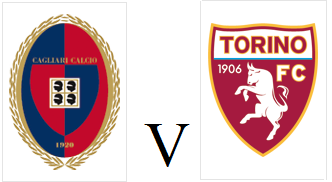 Torino will qualify for the last 32 of the Europa league if they avoid defeat against København in Denmark on Thursday evening. In fact, Toro could even qualify even if they were lose tomorrow's match, as Finnish champions HJK must beat Club Brugge in Belgium to have any chance of going through. The Granata have included three Primavera players in the squad, as Federico Caronte, Giovanni Graziano and Simone Rosso could all make their debuts. The home side have endured a miserable Europa League campaign so far, winning only one game, and they lost their last home game in this competition 4-0 to Club Brugge. Torino suffered an agonising defeat in the dying seconds, as Andrea Pirlo's last gasp winner broke Granata hearts. Giampiero Ventura made a brave selection ahead of the game, as he chose two former Juve strikers, Amauri and Fabio Quagliarella to lead the line for Toro. The away side feared the worst when after just fifteen minutes, Juventus were awarded a penalty when Omar El Kaddouri was penalised for handball as he attempted to block an Andrea Pirlo free kick. Arturo Vidal was forced to take the spot kick twice by referee Daniele Orsato, after there was encroaching on the first attempt, but the Chilean midfielder made no mistake to give Juventus the lead. However, just seven minutes later, Torino ended their 12 year (or 4662 days) wait for a goal in the derby, as Brazilian wing back Bruno Peres smashed that unwanted record in sensational fashion. After picking the ball up on the edge of his own area, the former Santos man sprinted ninety yards past three Juventus players before unleashing a fierce strike past Marco Storari. At the start of the second half. the two former Juve strikers combined but Fabio Quagliarella' effort from Amauri's through ball went narrowly wide of the post. Jean Francois Gillet made a good save to deny Leonardo Bonucci, whilst Toro twice went close on the counter attack through Marco Benassi and then Omar El Kaddouri. With twelve minutes remaining Stephan Lichtsteiner was sent off after receiving a second yellow card, and that gave Toro added hope that a first Derby Della Mole victory since 1995 was within grasp. However, with literally seconds remaining, Marco Benassi lost possession and the ball was fed to Andrea Pirlo whose sensational low drive from 30 yards out beat Jean Francois Gillet and crushed Torino hearts. As hard as it is to say after such a heartbreaking defeat, there were plenty of positives to take from this performance, as Toro finally scored a goal in the derby, and undoubtedly deserved at least a point. 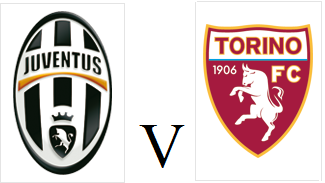 However, defeats like this will only make Toro's victory against Juventus all the sweeter, whenever that might be. 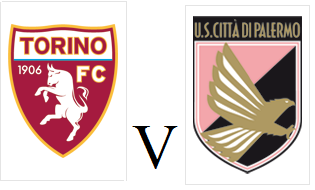 With there being so many Torino fans from all across the globe who visit this website or contact me on Twitter, I thought it would be a good idea to learn more about each fan, and how they came about supporting Toro. I've decided to start this feature with 'My Toro Story' but the idea is to make this a regular feature throughout the new season, so please email me at torinoblogger@hotmail.co.uk with your answers to the below questions and you too can be featured on the blog. How and when did you start supporting Torino : I fell in love with the club after reading about its tragic history in a copy of ‘FourFourTwo’ magazine whilst on a family holiday to Milan in 2005. Having been a big fan of Italian football since the days it was presented by the magnificent James Richardson on Channel 4 in England, it was only natural that I would go and see some live Calcio whilst in Italy, and I was luckily enough to visit the San Siro to see both Milan (v Palermo) and Inter (v Roma) play. The passionate atmosphere that I witnessed at both of these matches increased my interest in Italian football, and therefore I decided it was essential to find an Italian club that I could support. Both Milan clubs were immediately eliminated, as despite enjoying my experiences at the San Siro, I didn’t want to be accused of being a glory supporter by choosing one of the established giants of the Italian game. And then, as if by chance, I read about Torino – once the greatest force in Italian football before being beset by the tragedy of Superga. My mind was made up; Torino would be my Italian team. The fact that in 2005 they were plying their trade in Serie B didn’t deter me (My English team Southampton had also recently been relegated to the second tier), and something that I did not know at the time, but obviously know now, is that Torino won their last scudetto in 1976, the same year that Southampton won their only major trophy, The FA Cup. Maybe it is a coincidence, but I like to think that it was my destiny to become a Torino fan, no matter how corny that sounds. 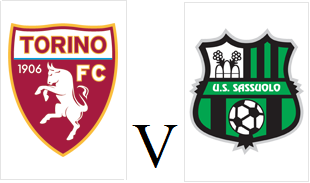 First Memories : I can remember watching my first Torino game on television in May 2006, as the Serie B playoffs were being broadcast on Eurosport in the UK. I was still in my early stages of being a Torino fan, so didn't really know much about the players, but can remember the commentators being confused about how the playoff system worked in Italy, and did not realise that the final against Mantova would go to extra time. First Match Attended : My first Torino game was in October 2006, but unfortunately it didn't go so well as the Granata lost 1-0 to Fiorentina after an early Martin Jorgensen goal. Favourite Former Players : I only like to judge players who I have seen play, therefore these are both players from the last decade. My first Toro hero was Alessandro Rosina who the team was built around after initially gaining promotion from Serie B. Those who know me also know that I have a somewhat unhealthy obsession with Rolando Bianchi, and I was lucky enough to meet him when his current club Bologna played in England last year. 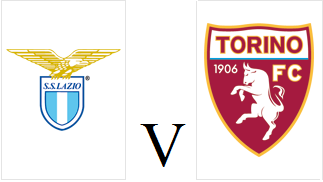 Favourite Torino Goal : Alessandro Rosina v Lazio. I'm slightly biased when judging this goal as I was able to witness this goal live in the stadium and literally couldn't believe what I had just seen. Predictions/Hopes for this Season : It will be difficult to replicate the sensational campaign of last year, especially with the departure of Ciro Immobile but another top half finish is certainly a realistic aim. A decent run in the Coppa Italia along with reaching the Group Stage of the Europa League (where we will hopefully face an English side) would represent a successful season in my opinion. 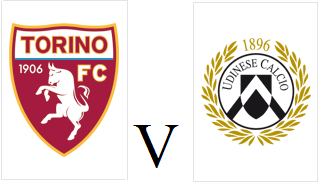 Torino will kick off their Europa League campaign with a two legged tie against Swedish side Brommapojkarna starting with the away leg on the 31st July. As expected, the side who ply their trade in the top tier of Swedish football prevailed against Northern Irish side Crusaders after a 1-1 draw on Thursday. 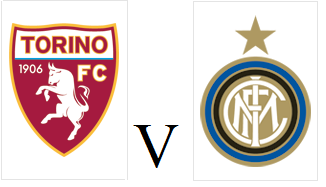 The Granata will be hoping for a favourable result in the first leg, ahead of the return fixture in Turin on August 7th. 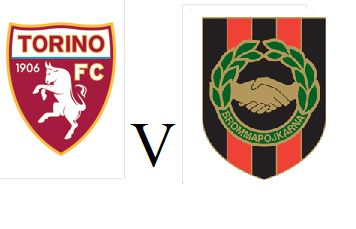 Torino will face either IF Brommapojkarna from Sweden or Crusaders FC from Northern Ireland in the Europa League third qualifying round. With Brommapojkarna 4-0 up following the first leg of their tie with Crusaders on Thursday, it is almost certain that the Granata will be facing the Swedish side in their first taste of European football in nearly twenty years. The Stockholm-based side only qualified for the Europa League via the fair play league, as they only finished 13th in their domestic league last season. This season, they are currently bottom of the Swedish Allsvenskan having only won once in fourteen matches - although as they are in the middle of their domestic season, they may be fitter than their Italian rivals who have yet to complete their pre-season fixtures. 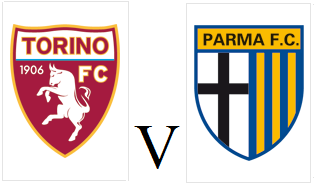 Torino will know their opponents for certain on the 24th July, and will then play the two legs of this tie on the following two Thursdays - the 31st July and 7th August. Torino have completed the signing of Fabio Quagliarella from rivals Juventus for a fee in the region of €3 million euros - nine years after the leaving the club after bankruptcy. Quagliarella scored seven times in thirty-eight appearances in his first spell with the Granata, the team he started his career with. Since leaving, Quagliarella has become one the best Italian strikers of his generation, with a reputation of scoring spectacular goals during his spells at Sampdoria, Udinese, Napoli and Juventus. The Italian international has won twenty-five caps for his country, with the highlight undoubtedly being this spectacular goal in the 2010 World Cup against Slovakia. Welcome Back to Torino Fabio! Torino added another reinforcment ahead of the new season by completing the signing of Antonio Nocerino on loan from AC Milan this evening. Former Italy international Nocerino spent part of last season on loan at Premier League side West Ham United and can also count Juventus and Palermo amongst his former clubs. Nocerino (whose wife is a Torino supporter) had been a main transfer target for the Granata this summer, but it was believed his high salary could scupper any deal. However, it is believed that AC Milan will now contribute to Nocerino's wages and that meant the deal accelerated quickly on Tuesday evening.